Come visit and enjoy some special treats at the Reflections School of Dance registration open house on Saturday, August 27th, from 10:00 am to 2:00 pm. Image courtesy of Reflections School of Dance. From a Reflections School of Dance news release. 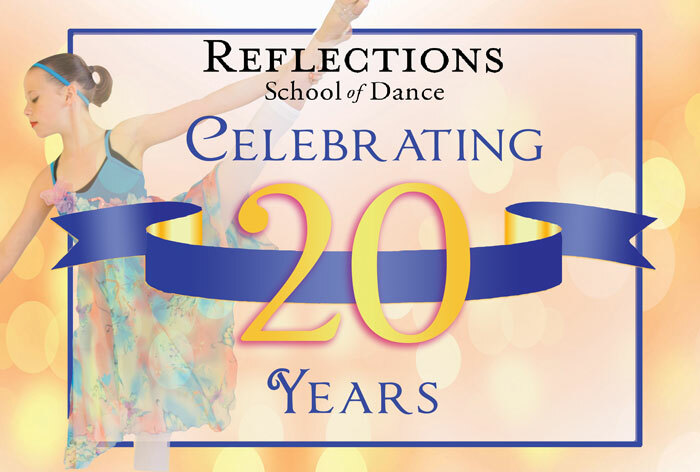 A local dance school, Reflections School of Dance, will be celebrating its 20 Year Anniversary this year and they couldn’t be more excited! In the summer of 1997, when Debbie Wiens was pushing a stroller with baby in tow through the Gold Creek, Silver Firs, and Mill Creek neighborhoods to hand deliver 3500 flyers to potential customers, her mind did not fathom what life would be like 20 years in the future. She certainly did not picture the thriving well-oiled machine that it is today. In the early days, without the luxury of social media to help her out, a business mentor had told her to expect a 1% return on her promotional efforts, and with her 400 square foot space still under construction, she opened for business two weeks later with exactly 35 eager students. Since that time the school has served thousands of students, traveled to places like Belize, Thailand, and Uganda to establish dance programs similar to the ones they offer right here in their beautiful, newly designed, state of the art Mill Creek facility. For the past 19 years Reflections School of Dance has focused on family-friendly values with wholesome and age appropriate music, choreography, and costume attire. With their “no charge for integrity” attitude, this dance school is personal, friendly, and on call for your excellent customer service. Reflections School of Dance students having fun before preforming at Movies in the Park on August 18, 2016. Photo courtesy of Reflections School of Dance. Many people in the Mill Creek area have come to love Reflections’ community performances over the years at places like local schools, annual Christmas Programs, Spring Benefit, Recitals, the Mill Creek Festival, Kla Ha Ya Days Parade, Mill Creek Santa Parade, and Snohomish County Park Movie Nights. Feel free to follow them on all social media outlets and check out the pictures online, and well over 800,000 YouTube views. Miss Debbie is also a local self-published author of two books including, “Life in the Studio and Other Funny Things That Happen to Me,” available on Amazon, which is a great entertaining read for all. Once again, Reflections will be providing a full offering of dance classes for the 2016-17 school year. With ten staff and 68 classes offered weekly, there is really something for everyone. Classes are offered for ages two through adult! Students love the convenience of dancing at Reflections as they offer morning, afternoon, and evening classes, six days a week. Reflections School of Dance students preforming at Movies in the Park. Photo courtesy of Reflections School of Dance. These classes include Ballet, Pointe, Tap, Jazz, Hip Hop, Lyrical, Acro, Jumps and Turns, Pre-School, Combo, Fitness, Performance Teams, and a brand new exciting class in Highland Dance. Reflections School of Dance is a safe and loving place where children and adults can express creativity, have fun, and grow in dance technique. If you are interested in becoming a part of the experience that Reflections School of Dance offers, contact them for details to register now for classes! Come visit and enjoy some special treats at the Reflections School of Dance registration open house on Saturday, August 27, 2016, from 10:00 am until 2:00 pm at the studio. You are invited! If you are not sure which fun and exciting class is best for your dancer you can call to set up a free trial class! Reflections School of Dance is so thankful to be in this wonderful Mill Creek community and feel the loving support of so many devoted fans. They look forward to the next 20 years of great service. For class schedules and all other information please click here to visit Reflections School of Dance website. Become a Fan & "Like" us on Facebook. Follow Miss Debbie on Facebook. Click here to see or subscribe to our videos. Click here to subscribe to Miss Debbie’s Blog. Reflections iconic old “pink barn” location from 2002-2014. Image courtesy of Reflections Dance Studio. Pre-School dancers enjoying class at Reflections School of Dance. Photo courtesy of Reflections School of Dance. Reflections School of Dance current studio location in Mill Creek. Photo courtesy of Reflections School of Dance. Pointe students at the ballet barre. Photo courtesy of Reflections School of Dance.